Pawel and I have made a point of visiting a least one “Blockbuster” restaurant in major cities or while on vacation. Before the flight was even booked, I had my #1 Mexico City Restaurant picked out. I thoroughly researched and read many blogs and magazines. I asked local Mexican friends and foodies and they all raved that Pujol (pronounced poo – jol, not poo – hol, since the owner is of Basque descent) was definitely worth a visit….so of course I had to go investigate. If you haven’t noticed, Mexican food is definitely making a splash in the culinary community worldwide. Mexican cuisine was added by UNESCO in 2010 to the “Representative List of the Intangible Cultural Heritage”, in other words Mexican cuisine is a “cultural treasure”. Even those high-fangled, fancy taco trucks are found in Paris. Mexican cuisine is confidently competing with the big guns (i.e. Le Bernardin, Per Se, etc) and I was super psyched to eat at Pujol, as it is ranked on Restaurant magazine’s list of the World’s Fifty Best Restaurants. For those of you who don’t know, this is one of those “lists” every restauranteur wants to be on (FYI another Mexico City Restaurant Biko is listed as well…looks like I have another excuse to visit Mexico City). Just like in New York, we thankfully were able to make reservations on Open Table with dining options of 7:30pm or 10pm (I read on eater.com that Pujol was still bookable, though it is rising fast to the list of “Toughest Reservations” to make). We took the early seating which which was a good choice, since we sat through 10 courses which took 2 & half hours to finish. As we took our seat, I was surprised by the size of the restaurant. Pujol itself was not overly swanky, very minimalist with maybe 40 seats…so this is Modern Mexican?!? Another pleasant surprise was the cost. “The price was right”, under 1000 pesos for each tasting menu even though we were expecting that it could be more. Pujol has two tasting menus, Tierra o Mar (Land or Sea). I chose Land, though part way through I thought shoot….did I choose the vegetarian option (see my photos….but no worries there was meat eventually)? For Mexican’s or anyone familiar with Mexican cuisine…it is cool to dine here and be surprised by the many childhood favorites reinvented. There are twists on street fare and Mexican ingredients displayed as artwork on a plate. I am lucky and proud to say “I know these ingredients”. Sipping on aqua frescas, snapping photos, and occasionally poking fun at some of the “snobbery” of modern cuisine (Pawel got the waiter giggling about the “guac dollops”)…I winked at the waiter and said “I can pipe guacamole puree too.” I truly enjoyed my dining experience. It was a relaxed and tasty evening. Pujol has quite an impressive wine/ drink list. I kid you not, it is a book of at least 20 pages. Though I was surprised that there was no option (or included cost) for wine pairings?!? I enjoyed several different “Agua Frescas“, one with cucumber puree and the other with Pitaya (dragon fruit). Beer is also available if you so choose. The first picture you see on Pujol’s website is their famous amuse bouche. It is a gourd with smoke coming out of it and inside baby corn cobs on a stick. This is a play on a traditional street dish called elotes and these “elotitos” are smoked with coffee mayonnaise (uh YUM) & dusted in salty ant powder (hmmm). What an amazing “one bite” (vegetarian dish #1)! Dishes #1 & 2 (seen above) are both also vegetarian. The first was a tasty three bite medley of guacamole. This trio of guacs were super smooth and each garnished uniquely; one with a fine brunoise of red onion, another chili powder and one with pickled jalapeño. They were served on a “chicharrón” (fried) parmesan crisp. The next dish was a twist on a traditional caprese salad. However, the “mozzarella” were fried cheese balls of Oaxacan cheese. The dish also had a neat use of the tomato peel, it was freeze dried or something…I can’t figure it out. The third dish is where I started to think I ordered the vegetarian…but, actually the white bean-like things on the tostada were actually ant larvae (I found this out when I went home to look up the dishes we were served). So I still thought they were beans with kohlrabi (I know this ingredient!) and leeks. Then the “meat” started to trickle in. 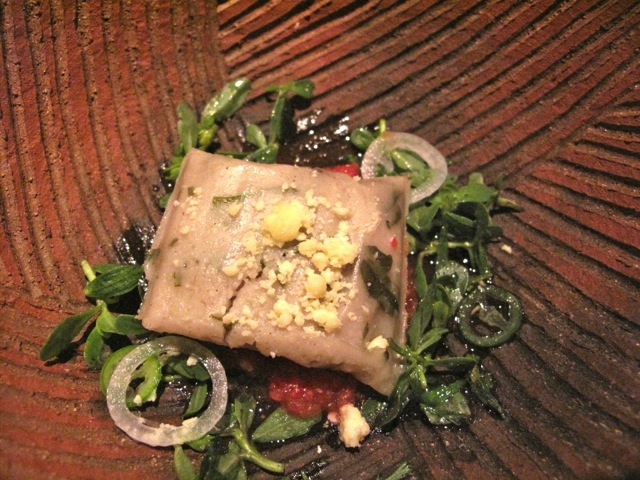 First, it was a bone marrow & chipilín tamal (see blogs main photo). Served with my new favorite “weed”, purslane and a savory, salty tomato compote. Dish #5 was my first favorite dish of the evening…an upscale fancy barbacoa taco. Barbacoa is a central Mexican dish of slow-roasted succulent sheep. Pujol really dressed this taco up with pea puree and hoja santa sauce. Can I have another? I normally get tres tacos, por favor! After the taco the meat came on heavy….with another favorite pork dish, of course with a “twist”…..Lechon…let’s just call it “pork belly” for the layman. This dish was jazzed up with a generous pour of black bean consommé and a scattering of pickled vegetables that packed a punch. Dessert soon followed (the Land tasting menu gets two). My first dessert was a fried plantain served with macadamia “dust” & cream. The second, a membray panecotte & yogurt ice cream. DELICIOUS! There was a palate cleanser of anise liquor/ sorbet and to end the night just right….chocolate mousse & orange cream in a shot glass. Absolutely perfect and spot on as far as Mexican ingredients go. You can NOT forget chocolate.